Hyperpigmentation – brown patches, marks, splotches – can be caused by excessive sun exposure, hormone imbalances, inflammation and injury to the skin. It most commonly appears on the face, neck and décolletage. It’s also notoriously difficult to treat. Before you can treat your pigmentation, you need to know what type you have. Those with fair skin are more prone to sun-induced pigment and people with olive complexions can be more susceptible to post-inflammatory pigment. 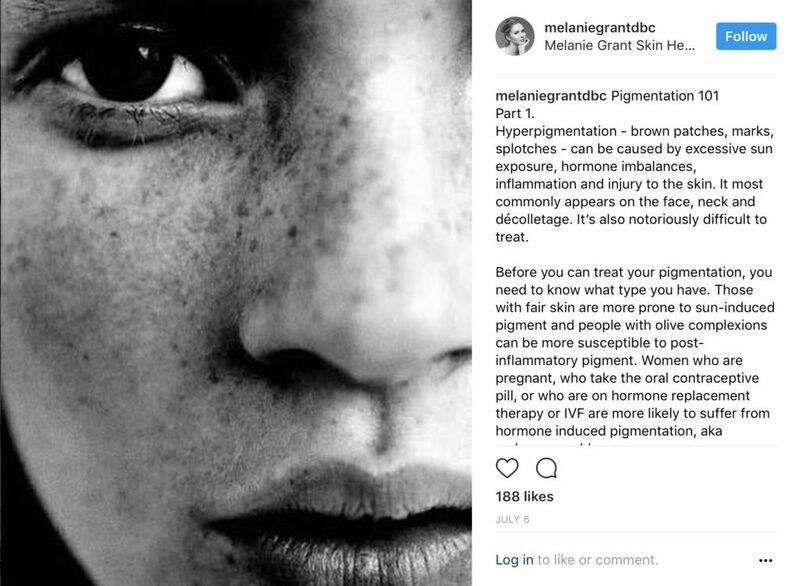 Women who are pregnant, who take the oral contraceptive pill, or who are on hormone replacement therapy or IVF are more likely to suffer from hormone induced pigmentation, aka melasma or chloasma. Hyperpigmentation will often appear as we become older as our melanocytes (the cells that produce pigment) increase in size as we age. Younger skin can be at risk of pigment from sun damage – that cute spray of freckles across the nose and cheeks can become more dense, causing uneven tone and darkness to the face, and melasma caused by the pill is very common in younger women. So if you’re serious about clearing up your pigmentation, I’d recommend the following. For sun-induced pigment I favour lasers such as Fraxel (Like the 1927 wavelength for pigment and remember this is a brand not a type of laser) and IPL. For hormonal pigment there’s no cure as such, however it can be managed with a good skincare regime and in-clinic treatments such as Pico laser or depigmentation peels, I find Cosmelan and Dermamelan are super effective. For early onset or minimal pigment, I like to combine low level, gentle peels with light therapy to gradually break down the pigment, brighten the complexion and unify skin tone. Unless you want to end up right back where you started, there’s no use booking in for clinical treatments if you continue to skip the SPF. Diligent sun protection is vital in managing all types of hyperpigmentation, this is where it starts! Some women even choose to stop taking the pill to ease the side effects of melasma. I also have a few favourite products to address pigmentation. I recommend dedicated lightening products such as Cosmelan and Lytera to my clients and with consistent use, along with diligent sun protection, the results are great. Look for brightening serums that feature ingredients such as vitamin C, niacinamide, bearberry or liquorice extracts, and azelaic acid. Prescription hydroquinone at around 4% combined with ingredients such as ascorbic acid and Kojic acid are a popular choice for doctors and dermatologists, however this combination can irritate the skin causing redness, inflammation and flakiness. Overuse can also make the pigment worse, especially for those with darker skin so be very careful. You’re very lucky if all this is new to you. It’s never too early to take preventative measures, and prevention will always be the best and smartest approach when it comes to hyperpigmentation. Sun protection is crucial, especially in our harsh Australian climate. 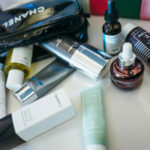 I also strongly recommend incorporating an antioxidant serum (vitamin C is a great double duty ingredient as it also brightens) into your morning regime and try following an anti-inflammatory diet.